We’ve all been there. You’re listening to a track and you hear what would be the perfect sample… but it’s part of a full arrangement and has a vocal line over the top of it. Previously, you’d have cursed your bad luck and moved on, but that was before Audionamix’s TRAX. TRAX products let you think about the sampling process in an entirely new way, as they enable you to remove unwanted parts and instruments to leave you with just the sounds that you want. So, all of those killer samples that you thought were inaccessible can now be freed from their original arrangements for use in your own productions. The creative benefits for DJs, hip-hop artists, remixers and all other kinds of music producers are obvious, but if you still need convincing, check out the video below to discover what TRAX is capable of. You’ll see TRAX Pro SP being used to remove speech from a clip, revealing the keyboards beneath, which become the first element in a new song. Next, TRAX is used to separate out a trumpet solo from another song, which is layered into the new song with effects and panned delays. Finally, a voice sample from an experimental jazz tune is extracted, then slightly detuned and used in a call/response with the trumpet. 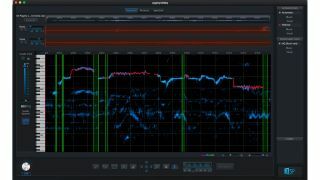 For sampling purposes, Audionamix recommends three versions of the software – TRAX, TRAX Pro and Trax Pro SP. Visit www.audionamix.com to learn more.